Over medium-high heat, preheat peanut oil in a large nonstick skillet. Add chicken to pan and brown for 2 minutes, stirring occasionally. Add onions and cornstarch and stir while crumbling meat to combine. Cook an additional 2-3 minutes, stirring occasionally. Add persimmons, water chestnuts, ginger, soy sauce, orange juice, and oyster sauce to skillet. Cook together for approximately 4 minutes, stirring occasionally. Remove from heat and let sit for 1-2 minutes. 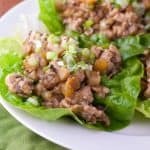 Spoon chicken mixture into the middle of each piece of lettuce. Sprinkle with additional green onions, if desired. Roll up and eat like a taco, or roll like a burrito and enjoy.